Deep Purple have refused to perform with guitarist Ritchie Blackmore at the band’s April 8 induction into the Rock And Roll Hall Of Fame. After a pair of acrimonious splits in the 70s and 90s, Deep Purple will not turn the clock back to reconnect with one of their founding members. "We were faced with a hard decision when we heard about the Hall Of Fame inductions,” explains singer Ian Gillan. “It was a surprise to us that [current members] Steve Morse and Don Airey did not qualify as inductees. "Ian Gillan, Ian Paice and Roger Glover decided upon the offer of a compromise which has been agreed with the Hall Of Fame and enables us to turn up on the night. Deep Purple inductees will accept the awards and then the living breathing Deep Purple will perform. "It should be stressed that there is no slight intended nor any desire to upset anyone regarding this decision; it is purely a mark of respect to Steve and Don. I spoke with David Coverdale last week and he expressed complete understanding of the way it was being handled. Thanks, David. You're a gent. Outside of this event, there are no circumstances under which a 'reunion' could or would take place. So, let's all get up there, shake hands, smile for the cameras and get it done with dignity and respect for all the existing and past members of a very special family." 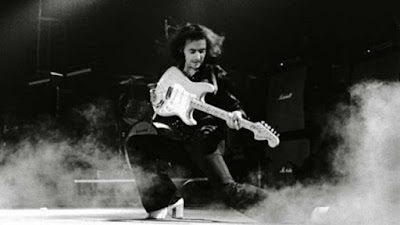 Blackmore’s camp issued a response to the news by informing fans via social media. Rock and Roll Hall of Fame President and CEO Joel Peresman clarified rumors that the guitarist was prohibited from attending the 2016 event. “There is no way he is banned from the ceremony,” Peresman tells Rolling Stone. “That notion we would ever do that is patently untrue. We've never banned any inductee. He is invited to come enjoy the evening and accept the award." "Deep Purple's manager Bruce Payne told me they were unwilling to perform with Ritchie," he says. "We've had many situations like this in the past and many times these things get worked out for one night, and then they go back to their neutral corners the next day. "We would love to have them all play together. We always want to do that. We always want to see the actual inductees that haven't performed together in a long time, if they have the opportunity to come together for at least one night, to do that. We'd like to see it as an organization, and I'm sure fans would like to see it too." Deep Purple will be inducted into the 2016 Rock & Roll Hall Of Fame alongside Cheap Trick, Steve Miller, Chicago and N.W.A. The April 8 ceremony at New York’s Barclays Center will honor most of the group’s first three lineups, including Gillan, Roger Glover, Jon Lord, Ian Paice, Ritchie Blackmore, Rod Evans, David Coverdale and Glenn Hughes.